World Voice Day is April 16th. I originally wrote this show for the one-woman musical “What the Hell are you Doing in the Waiting Room for Heaven? ?” but now I sing it in concert and with harp ensembles as a spontaneous choral piece. In the musical, a little girl has just asked her father what happens if she meditates and her soul disconnects from her body – how will she find herself again? If all her senses are in her body, and she loses them, so she can’t see, hear, smell or feel herself – how will she find herself back inside herself again? At first, her father doesn’t know how to answer, and then he begins to tell her that she has a voice beyond hearing or speaking, a voice that simply “is” her – a voice that needs no sound, no shape, no movement – but that simply “is” her – and it will always lead her back to herself. This is the sound that turns lost into found, when you sing. You have a voice that tells a tale. Nobody else can tell it as well. And this is the sound that turns lost in to found, when you sing. This video is from a performance of “You Have a Voice” from the Somerset Harp Festival, where I’ll be teaching and performing again this year(somersetharpfest.com). Come sing “You Have a Voice” with me at my concert at Somerset in Parsippany, NJ on Fri. July 19th (A limited supply of tickets will be available to the public in June HERE!) -OR- join me at Celebration Barn for my show July 27th – tickets will be available soon HERE! HARPISTS – being able to sing and play – alone or with other people – is one of the world’s greatest joys. Join my “Sing and Play Harp” online class. 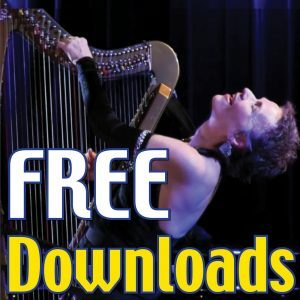 Learn more at SingAndPlayHarp.com! JOIN ME LIVE at SOMERSET for an ALL-day workshop July 21st, a Somerset Harp Weekend Add-on! Get the details & register HERE!